This class-pdf clocks in at 17 pages, 1 page front cover, 1 page editorial, 2 pages of SRD, leaving us with 13 pages of content, so let’s take a look! The Chi Warrior is a base class that receives d10, 4+Int skills per level, full BAB-progression, good Fort- Ref- And Will-saves, AC bonus scaling up to +5, fast movement scaling up to +60 ft. and a monk’s unarmed damage progression. On the nitpicky side, chi warriors are proficient with simple weapons “and unarmed strikes”, which while consistent, is unfortunately not how that particular component is usually phrased in PFRPG rules language. They also receive proficiency in light and medium armors, though, when unarmored, the class receives Charisma-bonus, if any, as dodge bonus to AC and CMD, thankfully with a caveat of losing the bonus when deprived of Dex-bonus for sufficient rules-consistency. It should be noted that unarmed damage dice for small and large chi warriors are provided in a handy table. The chi warrior class is further defined by their “discipline path”, which can be considered to be a kind of order/bloodline-style suite of options. Only that, while table calls it that, this ability does not exist – the pdf has renamed it “Fighting Style”, creating unnecessary confusion. Each such fighting style features signature weapons, associated Style Feats and level-dependant scaling benefits. The first of the Style Feats-lines of the Adamant Champion features a minor formatting glitch, where “Snapping” has been cut off from the feat and drawn into the ability header, but ultimately, that’s a negligible glitch as well. Powers granted by disciplines are called special moves and fall in three categories: Tsuki, the strikes; Katas, the forms and Ukes, the blocks. One particular tsuki or uke cannot be spammed – after using a particular special move, it has a 1-round cool-down – a mechanic I personally like, since it keeps combat from becoming stale and static. In fact, I think variable cool-down periods would have made this class even more interesting, but that may just be me. At 1st, 3rd, 6th and every 6 levels thereafter, the chi warrior receives 2 such special moves, though there is a restriction imposed on the chi warrior: At 1st level, the chi warrior chooses “one fighting style to focus upon” and two secondary styles. Any style not selected becomes prohibited. 1st level nets proficiency with the primary fighting style’s weapons and further benefits are gained at 4th, 10th and 18th level, while katas improve in potency at 4th, 10th and 16th level. Similarly, the fighting style determines the bonus feats learned at levels 2, 5 and 8 – here the chi warrior “ignore(s) all prerequisites of these feats”. When choosing style feats, chi warrior levels are treated as monk levels and Wisdom prereqs are replaced with Charisma prereqs. The section comes with a caveat that allows for feat-substitution, should the character already have a granted bonus feat. Additionally, style feats used by the chi warrior are not limited by their weaponry and can be used in conjunction with any weapon the chi warrior has Weapon Focus in. Finally, Elemental Fist and Stunning Fist are treated as style feats for the chi warrior. The respective katas tend to offer an internal scaling and the modification of fighting styles similarly offers a scaling mechanism. I will return to the respective disciplines below. For now, let me voice one particular issue here that I considered problematic – the set-up of abilities and how they are gained isn’t that hard to grasp, but the presentation makes it somewhat harder to grasp: The pdf establishes, for example the rules term “Primary fighting style” and then uses “one fighting style to focus upon” in another instance – this creates unnecessary confusion and renders the class more opaque than it should be. At 3rd level, the chi warrior receives Weapon Focus with unarmed strikes as well as with a weapon of the primary fighting style as bonus feats (again, including replacement options if the character already has either). Each weapon that fulfills the criteria of being thus chosen with Weapon Focus is furthermore considered to be a signature weapon, which ALWAYS adds full Str-bonus to damage, even when wielded off-hand or used in two hands (which is odd, as it can constitute a decrease in damage output) and the chi warrior may use the unarmed strike damage instead of the weapon’s base damage…which is all kind of problematic. “Any weapon for which the chi warrior has the Weapon Focus feat is considered to be a signature weapon.” See, the aforementioned Str-mod and base damage tweak, which already breaks one balancing mechanism of weapons, this breaks another. Weapons are balanced by damage, crit-range and multiplier, category (simple, martial, exotic, and sub-categories like monk weapons etc.) and properties like reach, disarm, brace, etc. – when you generate a class feature that basically breaks the damage component and applies it universally to all weapons, you have a system that does not play well with Pathfinder’s assumptions on how weapons work: With this set-up, a whip becomes universally better than a dagger, for example. Oh, and the ability fails to specify whether the damage-type of the base weapon is retained. On the defensive side, the class receives uncanny dodge at 5th level, evasion at 9th, improved uncanny dodge at 13th and improved evasion at 15th level. At 7th level, the chi warrior may activate a style feat and a kata special move via the same swift or move action and substitute Cha for Int or Wis regarding combat feat prerequisites. Level 9 may provide a problematic option: Chi Waves allows for the unlimited use of daily-use combat-feats, but “may not use any individual feat that normally has limited uses more than once per round or two rounds in a row.” So, which is it? Once per round or two rounds? What about Archon Diversion, for example? The feat can usually be used 1/round? Does it suddenly gain a cool-down? Does this eliminate the 1/24 hour caveat of hexes delivered via Hex Strike? I assume not, but I’m not 100% sure. Beyond that, while certainly not all combat feats limited as such really need the limit, e.g. Elemental Fist does certainly warrant the limit when compared to similar class options. Furthermore, there are quite a few interlocking mechanics that allow for the expenditure of Stunning/Elemental Fist uses – which becomes problematic fast. A means of offsetting at least some components of this component would have been to retain the actual expenditure of daily uses, but only expend them under specific circumstances. For example, when a character utilizes the same attack over and over again, the use is expended; if, instead, the character alternates attacks while the cool-down runs low, the use is not expended. Basically, by choosing to eliminate the restriction instead of working/modifying the restricting mechanics, the class has opened a significant bag of issues. 11th level provides an option to have two style feat stances at work at the same time – and yes, this gets activation/switching’s language right – kudos! At 19th level, the class can perform one special move kata or style feat stance as a free action and 20th level provides a totally out of place fey-apotheosis that is bland when compared to the rest of the class and has literally nothing to do with the rest of the class features, suddenly also imposing a chaotic angle with DR 10/lawful. Puzzling decision there. All right, so what about the fighting styles? The first of these would be the Adamant Champion, who gets free intimidates/weapon drawing when checking for initiative as well as snapping turtle style specialization. The former is problematic: Does the free intimidate check count as a turn/not being flat-footed anymore? The respective abilities here are unsurprisingly defensive in nature: Absorbing Armor, for example, nets you 1/4 the damage you take from an attack as DR/- for the next round. The uke is activated as an “immediate action whenever the chi warrior takes physical damage” – which is kind of problematic on a rules-language level. Immediate action and “whenever the chi warrior takes damage” seem unnecessarily contradictory. Also problematic: 16th level nets this DR for 5 minutes. So, does a new activation override the old one if the DR exceeds the old one? If so, do you calculate the DR based on the unmodified damage? This is relevant, since at 4th level, the DR already applies to the triggering attack. Pretty powerful would be Champion’s Rally: As an immediate action, allies within 30 ft. that need to save (first Fort and Will, later also Ref) can have the Chi Warrior save as well – if he succeeds, neither are affected; if he fails, he’s affected as well. And yes, this extends evasion to allies. On the plus-side, this does get interaction right when a chi warrior would also be affected by the prompting effect in the first place, though the wording here is slightly wobbly: “On a failure, she only takes the worst of the results…” Still, this is me being nitpicky. At higher levels, multiple saving throws are available. Standard action attacks that double base damage and instill temporary debuffs can also be found here. Inspiring blow is interesting: It nets chi warrior level + Cha-mod temporary hit points to an ally within 30 ft., doubling that amount at 10th level. Yes, this means that carrying around a bag of kittens and bashing their tiny brains in will provide temporary hit points to allies. Why is there no HD/CR-caveat here? Well, at 16th level, the chi warrior can heal, though thankfully, the healing has a daily cap so we don’t get infinite healing. While I consider the kitten-failure bad design, at least we don’t get infinite healing. There is a second auto-buff that falls prey to a similar kitten-failure, but sports a cool-down and may only be used on one creature at a given time, making it the more elegant design. I’m personally not a fan of the ability to add Con-mod to social skills, mainly since dual attributes to skills can easily be gamed for ridiculously high bonuses and particularly so when Bluff and Intimidate are concerned due to their combat relevance. On the other hand, conversion into nonlethal damage and faster nonlethal damage regeneration is pretty awesome and not something I’ve seen before. Better yet, it does have a caveat that prevents abuse by creatures immune to nonlethal damage. Quicksilver Duelists focus on Snake Style and are all about duelist style – including debuffs for foes ignoring them when challenged to two standard action melee attacks at -5/-2/no penalty/3 attacks to bonuses depending on opponent size. The standard action attacks are powerful, yes, but the lack of combination options remedies them somewhat and skirmishing becomes more viable, so this gets a pass. Personally, I’m not a big fan of the inclusion of the swingy, d20 vs. d20 perfect parry herein, but that is personal preference. A variant of this, razor riposte, needs to specify whether the retaliatory combat maneuver still provokes AoOs from the target. Similarly, the standard action strike challenge is odd: Multiple opposed attack rolls; when the chi warrior deals damage, it’s full damage; if not, he takes Str-mod damage, minimum 1. Generally, not a big fan of the swingy, pretty time-intense opposed roll concepts. The Panther Strike-focused Shade Phantom has some issues: As a standard action, they can execute an attack that deals twice the damage and, at 4th level, forces a Fort, Ref or Will-save (promoting meta-gaming) – failed Fort renders the target exhausted, Ref staggered, Will confused: All very powerful conditions that are HARD to inflict for a reason. For 1 round at first, granted, but still – at 10th level, it’s Cha-mod rounds, which means the foe is pretty much screwed. At 16th, the poor sap must make all three for pretty much the ultimate debuff strike. There also is a shadow clone ability that almost gets it right – item sharing and the like is covered and the increasing array of options is great – but at a high level, the ability fails to specify how sharing of special moves and limitations thereof apply to the clone – does it count as a separate entity or does it share a pool/cool-down restrictions with the chi warrior? Negative level-imposition and reducing movement rate are also part of the deal here and scaling Stealth-bonuses/invisibility-duplication can also be gained. Finally, Storm Fist, focusing on Dragon Style sports Acrobatics-bonuses alongside high-level options to ignore difficult terrain as well as increased damage (double/triple) for provoking attacks of opportunity – which is pretty excessive in my book. On the other side, suspending Fort-save based negative conditions is pretty damn cool. I also like the option to give an attacker a bonus to atk to gain a similar bonus – this style is basically all about risk/reward. The class comes with favored class options for core races as well as some Porphyra-specific races. Archetype-wise, the class receives the Dual Specialist, who gains two primary fighting styles, but no secondary fighting styles and no bonus style feats. There also is a fighter archetype that allows for the limited dabbling in fighting styles and 6 complementary feats. The pdf closes with a sample level 1 human chi warrior. Editing and formatting on a formal level are pretty concise, though there are some hiccups on a rules level. Layout adheres to Purple Duck Games’ printer-friendly two-column b/w-standard and the pdf comes fully bookmarked for your convenience. 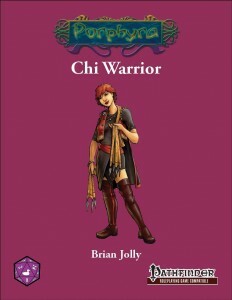 I really want to like Brian Jolly’s Chi Warrior-class. I actually like a lot herein. It does a lot of things right: For one, it allows for valid skirmishing tactics and rewards flexibility via the cool-down mechanic – in playtest, chi warriors never executed bland standard attacks, always going for special moves, style changes, etc – this did look for a while like a truly variable one… In practice, the limitation of cool-down periods to (mostly) negligible time frames mean that you can’t spam one combo – but you can spam two alternating combos. Basically, the class would have been better served by more special moves and longer cool-down periods. The class does sport some design-aesthetic decisions I do not like as a person (opposing rolls) or consider sloppy (in the case of not kitten-test-failures), but neither of these two are the crucial components in the decision on how to rate this. In my book, the chi warrior has three flaws. One, its own nomenclature could be a tad bit more precise and internally consistent. Two, it could have used more non-combat-relevant tricks. Those two are not too serious. Three, it is arguably too strong. The chi warrior has a superb chassis – all good saves, full BAB. It gets a lot of feats and the scaling fighting styles – though these, once again, would not make the class problematic. The big issue of the class is that it tries to “fix” some components of the game that don’t require fixing. The streamlining of weapon damage that ignores weapon properties, crit modifiers/ranges/etc. is insane and BROKEN. Don’t believe me? Weapon Focus Shuriken upgrades base damage to the unarmed damage progression of the monk. Basically, it tries to make weapons behave similar in scaling as in 13th Age, in a system simply not made for it. While more esoteric, the de-limitation of limited-use feats opens a similar can of worms that just begs to be powergamed to smithereens. What’s frustrating about this for me is that the class needs neither of these needless “fixes” – the chassis, sans these two highly problematic, broken components, is already strong enough and more than competitive with the better martials. In fact, it surpasses them already with the relative ease of multiple standard action-based attacks that only come at low penalties (or later, none at all). Even sans these two components, the class is strong and imho would have benefited from a more diverse cool-down management as an additional balancing mechanism for the more powerful combinations. Add to that dual attributes to stats and similar minor flaws and we have an overall construction that GMs should carefully contemplate before putting it in the hands of even a remotely capable power-gamer – not because it necessarily is broken as intended, but because it begs to be broken as provided. This should go nowhere near any game that’s not high-powered to begin with. Is this a fun class? Well, yes, it can be. The base ideas and mechanics of the fighting styles definitely deserve being called unique, though I wish the styles themselves were more diverse – quite a few abilities boil down to opposing rolls for damage or damage negation and others present varying iterations of the “standard action for multiple attacks”-trope – which is fine, since the fighting styles and katas etc. eat move actions, swift actions etc. Still, I wished the class had even more diversity and utility, less “I bash your face in.” Now, as a person, this has several components that rub me the wrong way and covers almost all of my pet-peeves in one fell swoop – this will get nowhere near my homegame. As a reviewer, I do appreciate the mechanic ideas behind this and the chassis, which, when purged of the broken aspects, is a pretty interesting basis to craft your own material on. In fact the action economy management component of this class is pretty much inspired and (almost) getting a balanced shadow clone ability done is impressive. In a lot of instances, the execution of complex concepts works herein and is something I appreciate. In fact, this class has all the makings of being the martial class I always wanted and then jams “fixes” that create a whole lot of problems in class abilities and simply enter unnecessary additional power into the frame. Basically, this overshoots the target by quite a lot, mainly due to opening cans of worms the class didn’t need to open to be competitive, and has some serious flaws that need nerfing/to be killed with fire. The chassis is damn cool, but as written, I cannot recommend this class. My final verdict will clock in at 2.5 stars, rounded down to 2 for the purpose of this platform.